It's officially a tradition: Punch Brothers are returning to New York City for another three-night New Year's run at Bowery Ballroom! If you'd like to spend your New Year's Eve (and the two preceding nights) with us, a batch of pre-sale tickets will go on sale tomorrow, Sept 18, at 10am ET at PunchBrothers.com/Presale. To really get your money's worth, there will be a handful of 3-day passes available and if you'd like to go ahead and reserve one of the limited-edition posters we have in the works for the run, you can add that on with your ticket and pick it up at the show. Public tickets will go on sale this Friday, Sept 20, if you're too slow on the draw during the pre-sale but don't wait too long as all three nights sold out last year. 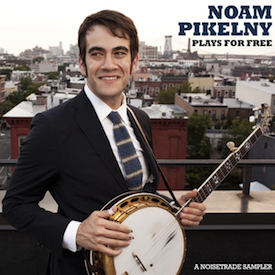 Pickles is offering up a free sampler on NoiseTrade, which includes the premiere of "Brown County Breakdown" from his forthcoming album Noam Pikelny Plays Kenny Baker Plays Bill Monroe, coming October 1st. You can pre-order the album on CD, vinyl, or in a handsome bundle, which includes signed items and an exclusive letterpress poster. All pre-orders come with an instant download of "Fiddler's Pastime," and you can also stream "Big Sandy River" here if you happened to miss it. Expect to hear some of the new album live on Noam's tour with Bryan Sutton, Luke Bulla, Barry Bales, and Jesse Cobb which starts in mid-October, following another trek around the Northeast with the NY Banjo Summit. You can see all of Noam's upcoming dates, including a Noam & Friends set at FreshGrass this Saturday in Massachusetts, on his tour page. Looping back around to the boroughs, several of the boys will be performing at Brooklyn Bluegrass Bash this Sunday afternoon, Sept 22, at The Bell House. Paul will be back in trio formation with Brittany Haas and Jordan Tice, Noam will be a titular friend in Jen Larson and Friends, and the afternoon will come to a close with a Chris Thile & Michael Daves set. A few tickets are still available here. The next night, Thile will turn Rockwood into Bachwood for the first of two nights (the second on the 25th) that'll serve as a warm-up for his impending solo tour. As a brief refresher, the tour will take him all across the US (+ Toronto) throughout October, starting on the 1st in Seattle, followed by a series of dates in Europe in November. Some recently added cities include Portland, Laramie, Columbus, Knoxville, and Louisville; be sure to check out the tour page to see if he's coming your way. Critter has his own special show coming up at Rockwood with Michael Daves on October 5th, in which the duo will play songs exclusively by the Stanley Brothers, highlights from the month of Stanley Brothers music they performed in July. Tickets are available here. And a reminder that Thile's latest, Bach: Sonata(s) and Partita(s), Vol. 1 will be available on vinyl next Tuesday, Sept 24, and is still available for pre-order. The vinyl version of the album only has room for the first sonata and partita, but the pre-order comes with a digital copy of the entire recording, Sonata No. 2 in A Minor included. So that'll just about do it for this time around, peruse those dates and place some pre-orders if you're so inclined!